Last weekend, Noel and I went to see The Devil Wears Prada. It’s a really fun film with a wonderful performance by Meryl Streep that straddles the line between authentic and scenery-chewing. But as it happened, there were whole stretches of the film I’ll have to see again because I got so excited by the fact that all the office lobby and exterior scene were filmed in the building where I work, The McGraw Hill-Rockefeller Center Building at 1221 Avenue of the Americas in midtown Manhattan. And a lot of the movie happens in those locations, so I spent scene after scene giggling and pointing like a little schoolboy. “I walk past there every day!” “That’s my elevator bank!” “That’s not where the security desk is!” And so on. I can’t wait for it to come out on DVD so I can see what I missed. 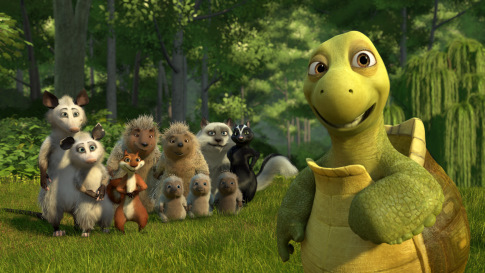 On Independence Day, instead of fighting the crowds (as we’ve done in years past) to see the fireworks over the East River, we went to see Over the Hedge. Oh my God… Sidesplitting doesn’t even begin to cover it. I laughed so hard I literally thought I would pee myself. There’s a scene with a dog (I won’t say more) that I missed parts of because I was in hyperventilated hysterics. Now that’s a film I can’t wait for the DVD of.